Why use Mobile Power Dialer? MobilCTI Power Dialer offers following main features that will increase productivity. 1) Ability to create multiple Campaigns fast and easy. 2) Ability to import Contact Lists from either Google Contact Groups (Cloud) or .CSV files. 3) Ability to Suspend, Activate or Delete campaigns. 4) Place calls to contacts in either Preview dialing or power dialing mode. 5) Built in Do Not call capability to prevent calls to phone number in application’s do not call list. 6) Ability to configure maximum attempts for each contact. 7) Caller can reschedule contact by one click to be dialed in 15 minutes or in 1 hour or in 1 day. 7) Caller can capture call outcome and add notes at the end of each call. 8) Built in report that shows progress for each campaign. 9) Ability to export contact results to CSV file. 1. Launch Mobile Power Dialer. 2. Click on "Create/Edit Campaigns and Contacts" button. 3. Click on "Create New Campaign" Button. 4. Choose the .csv file OR Google Group that contains the contact list . 5. Set appropriate start and end date. 6. Click on Create Campaign. 7. 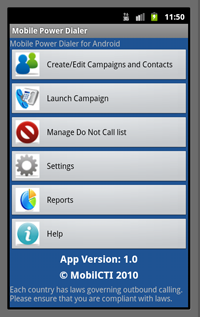 Once you are ready to dial your contacts, choose "Launch Campaign" from main page. 8. Please view settings to make any adjustments necessary. 1. Download the WeeklyLeadsSample.csv Template.Click here. 2. Rename it and modify the contact list. 3. Copy it to your phone's SD Card. (Alternately You can email it and then download it in Android Device. When you save the attachment, it will be saved in sdcard/download folder). Follow instructions on top to create a new campaign or importing them to existing campaign. Attention Early Adopters, Small Business Owners! MobilCTI Power Dialer is an unified Sales/Campaign tool and utilizes powerful outbound/email/sms technologies. 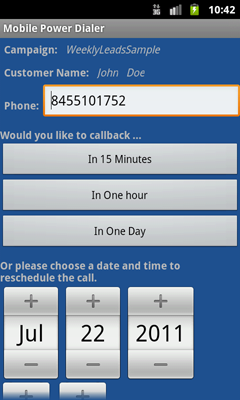 It is simple and effective tool for making automated outbound calls using your Android or BlackBerry Phones. It is very easy to use and one time fee. 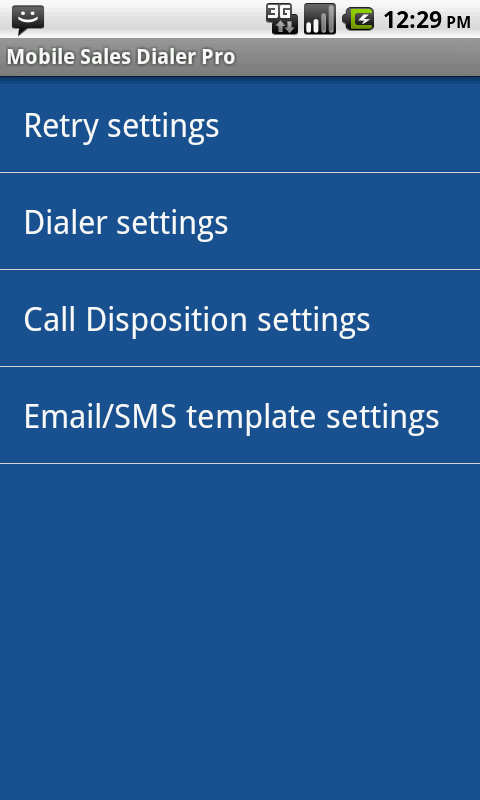 Also checkout the free version of our application called "Mobile Power Dialer Lite" in Android Market Place. All great functionality of power dialer plus powerful inbound call handling. 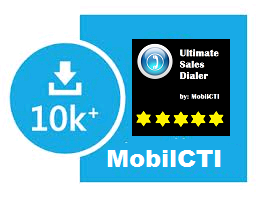 Ultimate Sales Dialer will display caller information such as Customer Name, Company, Campaign when some one calls your cell phone using MobilCTI database. The application let user configure what is the maximum time an contact should be tried. Also the time between busy, No Answer and Voice mail can be set by the user so the application tracks whenthe call needed to be made again. The application can be configured to work in preview mode or power mode. 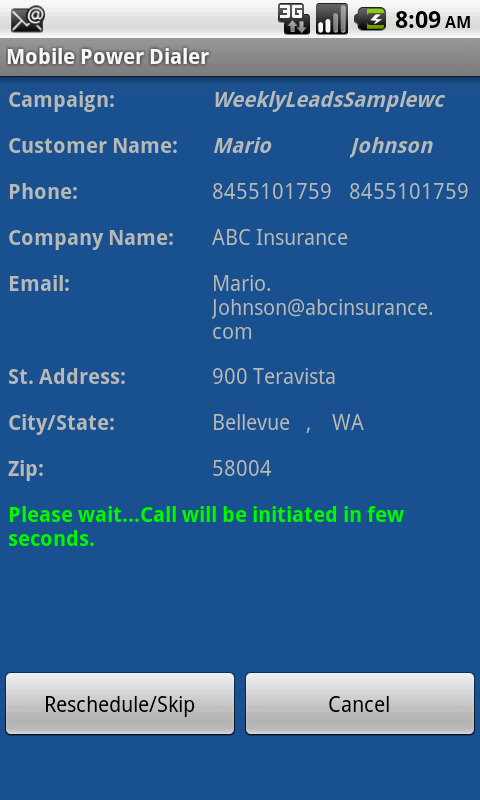 In preview mode, the user will be presented with contact information with Dial Now button. 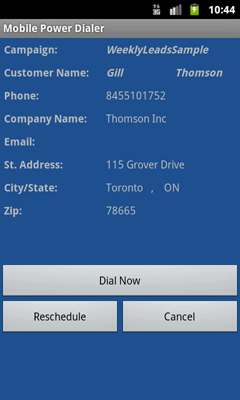 When user clicks on Dial button, the application makes the outbound call. In power mode, the application will make one call after another. The pause between calls can be changed under settigns pages. User can exit the campaign by pressing the cancel button. Another built in functionality is detailed reporting. Users can view summary of a particular campaign to see how many contacts have been reached, resulted in error etc. Also the application allow the user to export detailed reports to CSV file. The application let user create campaigns, manage cmapaign status and contacts within campaign. 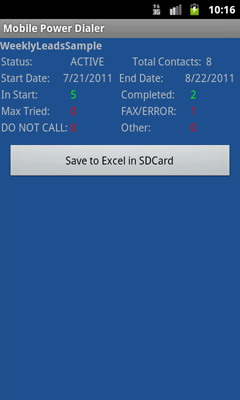 The application allow user to schedule a call back with one click. Also it provides a flexability to schedule call back at a specific date and time. The application allow the user to correctly disposition the contact result. For example, if contact phone number is busy, the application will automatically call the number again in 15 minutes. Also it allows user to set maximum number of tries, time between each try ec. The applicaiton allows use to capture the outcome and input notes about the call. User will be able to export these results as part of report. "I recently bought Ultimate Sales Dialer Pro - it is superb. It makes staying in touch with clients easier and faster for outbound calling. Client records can be updated immediately for inbound calls. I use it with the Android stock SIP dialler routing calls via the settings for GulfSip. It also works with their app. I have hooked up my laptop as a wi-fi keyboard to enter data in to the app on the phone as well. Best value of any dialler I've used - and I have used several on all platforms. " 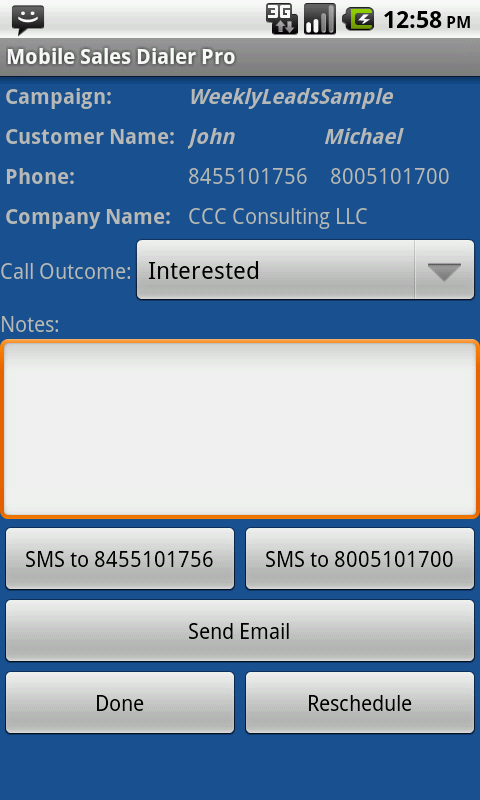 ​​There really isn't anything out there like this that offers a full CRM with a Dialer exclusively on the android. Main screen where you can create and launch campaign and view progress. Also this application provides various settings so user can highly customize the application. 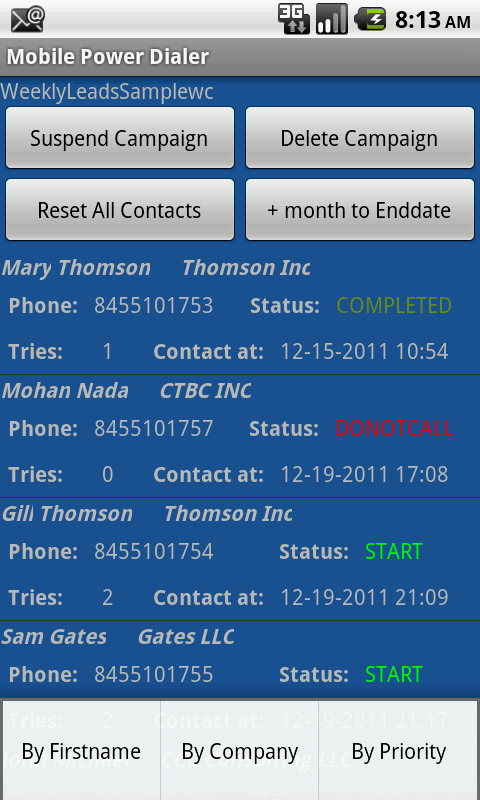 Ultimate Sales Dialer Only: Inbound caller info (screen pop) by preforming database search using caller ID.